San Francisco Metblogs » Have horse? 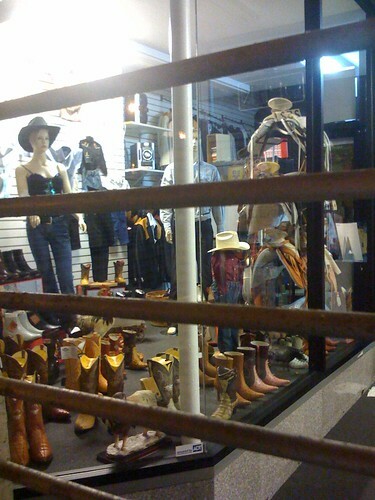 The obscurity never really dawned on me until now, but you can buy a saddle for a horse at OK Corral Western & Work Wear right smack in the middle of the Mission. Is there a stable nearby that I don’t know about? Don’t get me wrong, I like fun surprises like this. I am genuinely curious as to how many saddles they sell, who buys them, and where the horses are that wear them. the wild weadt n all that, member? I used to board a horse in San Carlos…I was more curious about having a saddle shop in the city because when I purchase a saddle for my horse, I usually haul him to the store to fit his saddle. I don’t see myself hauling my horse to Mission St. in the Mission to do that. Anyway, it’s pretty cute that a store has kept its roots and is an anomaly in the middle of the city.